As a graduate student and MFA candidate in the Puppet Arts program at the University of Connecticut, Lindsey “Z” Briggs, puppeteer and manager of The Jim Henson Foundation, did her thesis research on the lives and legacy of Rufus and Margo Rose and has organized their archives. She has generously provided some background about them and their founding of the Eugene O’Neill Theater Center which, since its beginnings, has always been a home for puppetry. Rufus Rose and Margaret Skewis met while working for Tony Sarg, who is considered by many to be the father of modern American puppetry. Through their work with Sarg in the late 1920’s, they were able to tour nationally and even perform on Broadway. 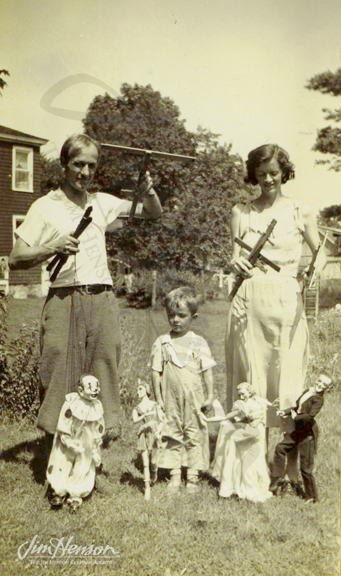 In 1931, the Roses were married and the Rufus Rose Marionettes were formed. In the midst of the Great Depression they toured throughout the United States with their full-length marionette shows. Although they started out with little money, they were able to survive doing what they loved. Besides their work on The Howdy Doody Show, the Roses were involved with many other television and film productions. On December 24, 1948, Rufus and Margo performed A Christmas Carol live on ABC, marking the first live broadcast of a full-length marionette production. They were also the head designers and performers on Chicago WGN-TV’s The Blue Fairy, which received a Peabody Award in 1958. In addition, they created many full-length puppet films including: Treasure Island, Rip van Winkle, and Aladdin. Rufus and Margo were founding members of the national organization Puppeteers of America, and were instrumental in the creation of the Eugene O’Neill Theater Center, as well as the National Puppetry Conference in Waterford, CT. In fact, one of the theaters at the O’Neill – the Rose Barn – is named after Rufus and Margo Rose. Rufus and Margo both believed strongly in sharing the art of puppetry and their craft with anyone who might be interested. It is no surprise that the Hensons and the Roses became fast friends. They shared a mutual interest in puppetry, and the Roses’ sense of humor and love of life was a joy to be around. 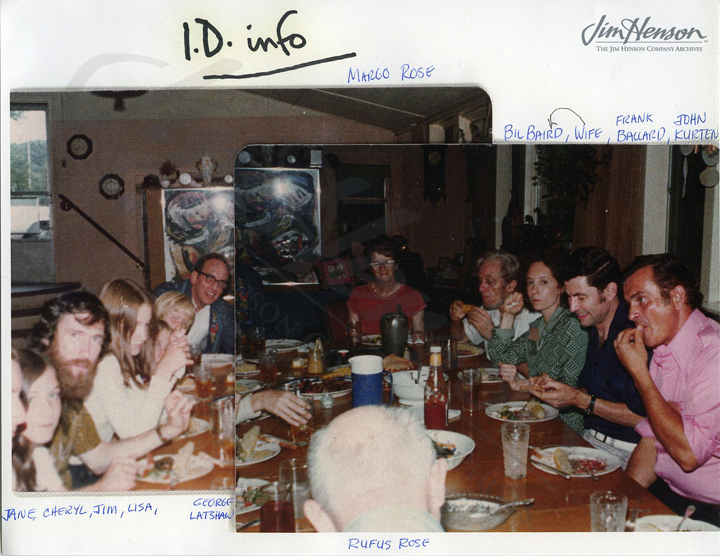 In looking at this photo (below) of so many amazing puppeteers gathered around the table for a dinner at the Roses’ house, I can only wish that one of those plates was my own. A gathering of puppeteers at the Home of Rufus and Margo Rose, c. 1974. Rufus and Margo Rose with their son Jim in the 1930s. Courtesy of the Rose Archives. 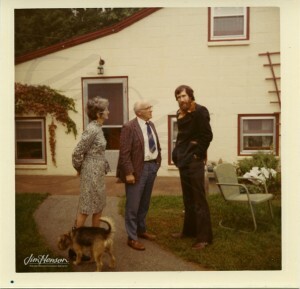 Jim with Margo and Rufus Rose at their home, c. 1974. Courtesy of the Rose Archives. 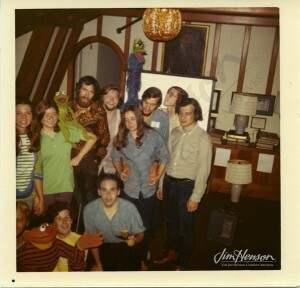 Jim teaching puppetry at the O’Neill Theater Center, c. 1974. Courtesy of the Rose Archives. This entry was posted in 07-July '74, 1974, Social and tagged A Christmas Carol, Aladdin, Eugene O’Neill Theater Center, National Puppetry Conference, Puppeteers of America, Rip van Winkle, Rufus and Margo Rose, Rufus Rose Marionettes, The Blue Fairy, The Howdy Doody Show, Tony Sarg, Treasure Island. Bookmark the permalink.